Explore the best of Toronto on a narrated, hop-on hop-off, double-decker bus tour, then take a full-day trip to Niagara Falls. Get to know the sights and sounds of Toronto in customized fashion, with live onboard commentary from a professional tour conductor. 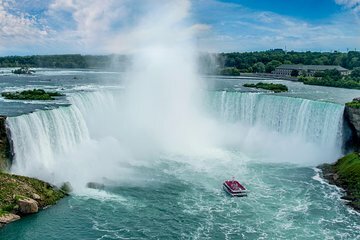 At the Falls, take in must-have experiences like riding to the edge of the iconic Horseshoe Falls on the Hornblower Niagara cruise. Then experience a breathtaking panoramic view of the Falls while enjoying a delicious buffet lunch. I really enjoyed this tour. The length was just right and the buffet at the Sheraton was EXCELLENT. The wine tour was good, the bartender inside the store was a little rude which caused me to change my mind buying some of i thece wine but the tasting was delicious. I enjoyed having time to walk through the little city after Niagara Falls and visit the shops and boutiques. There's a couple of things I would change. The description said a complimentary hotel pickup but didn't come to our hotel by the airport. We had to catch a Lyft to a downtown hotel Fairmount York to be picked up which we found only after purchasing the voucher. Viator needs to be clear if you're not downtown then you will not be picked up. We asked if they could drop us off near our hotel, the host said it was too far which I disagree but we made it back safely and that was the good part. Thank goodness the customer service was very friendly when we booked and explained that we had to find another hotel to be dropped off. Another thing is the time from getting off the boat and walking back to the bus in front of the Sheraton at Niagara wasn't a lot of time. We had to almost run back to get back by 4 PM and with all the hundreds of tourist walking, hot weather, should have given at least another 15 minutes to get back because it took some time to walk back. Other than then, I greatly enjoyed the trip and would highly recommend it again. Be prepared to walk and wear comfortable shoes. A superb day, well organised by the company. Be careful though, this is not the companys fault but lunch was at The Sheraton hotel and the waiter tried to over charge us for our drinks which we bought with our lunch. When I questioned our bill he got very defensive so much so I had to ask for the manager, who was no better! Grant was an excellent guide and the driver really added to our knowledge of the area. In addition to the falls, the ice wine tasting and Niagra on the Lake were superb. Nice little town and great fruity wine with explanation of how it is made. Hop on Hop off tour was good and stops at many places. I visited Casa Loma on this tour along with the Rogers Centre downtown. Great value for the money as are most of Grayline tours. The whole Niagra trip, from pick up to drop off, was most enjoyable. Credit for this has to be given to our excellent team of our guide Judy and our driver Laird. We were never rushed and had an interesting commentary throughout the journey. Like all large scale tours there are quite a few pick ups, but this did not seem too long and we were soon on our way. We visited a winery, Niagra on the Lake and then Niagra Falls, where a very good lunch was provided on the 13th floor of the Sheraton Hotel. Before we boarded the Hornblower boat which would take us right into the falls, Judy gave us three key pieces of information which were very useful. Don't put your poncho on until you are about to board the boat, else you'll just cook in the sun. Tie a knot in the bottom on both sides of the poncho unless you want it blowing off in the wind. Don't rush to go upstairs, but head to the front of the boat. We then toured the Niagra Falls area and were given ample time to explore before heading home. Could you please publish an international telephone contact number for those people that do not arrive in Canada until the day before, so pick up time and location can be confirmed. The hop on hop off Toronto city tour was a great treat that couldn't have been done on our own. 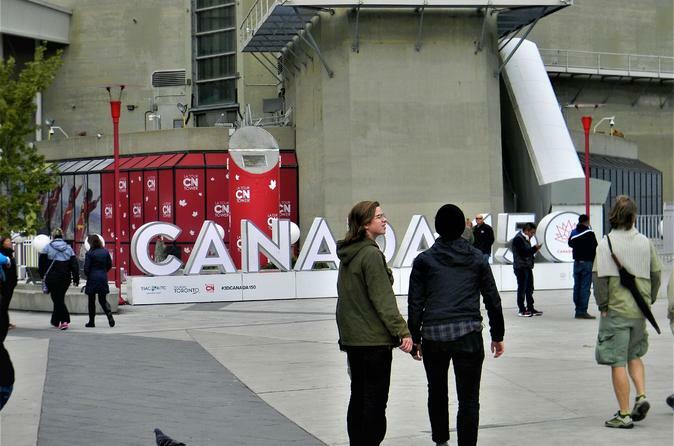 Although we missed out on some celebrity sightings with the Toronto International Film Festival happening that week, the whole experience was fantastic. Thanks much. We were a group of 12 classmates with some travelling from as far as Australia, UK and California having a reunion in Toronto and decided to go on a Niagara Falls Tour. Boy was it fun !! The driver, Peter, was fantastic and the tour guide was equally knowledgeable and awesome. The included wine tasting at a winery, boat cruise on the maid of the midst and buffet lunch at the Sheraton hotel at the Falls was amazing. Would definitely do this again and highly recommend this tour to anyone visiting Toronto. Thank you so much Viator and Gray Line for making our reunion in Toronto so memorable. Trip was great except for time we had to wait while 3 people did the helicopter ride. Suggest making specific buses for those doing the helicopter option. The service was not provided as agreed. Upon purchasing the service they indicated that they picked us up at the hotel and returned it to us. At the time of buying the tickets I indicated in three occasions the name of the hotel and the address and they said that the bus picked us in the same one.When we called to confirm the day of the trip and the pick up they indicated they were not picking up at the hotel. We tried several ways to explain that we had bought the ticket with them because they assured us to pick us up at the hotel. They were not willing to offer alternatives. We even told him to check the recording on the day of purchase. They indicate a bus stop to pick up. It was better and safer for us to pick up at the hotel. In the afternoon, they did not even leave us at the same stop. The tour guide and driver were great. I enjoyed the Falls but because of traffic it was an 11 hour day. I would also make the helicopter tour separate.